SSC JE Recruitment 2016 – Apply Online for Junior Engineer (Civil, Mechanical, Electrical) Posts: The much awaited SSC Junior Engineer notification announced for the year 2016. The Staff Selection Commission (SSC) has issued a recruitment notification for the recruitment of Junior Engineer (JE) posts. SSC has invited online application for filling up Junior Engineer (Civil, Mechanical, Electrical) vacancies in Central Water Commission, CPWD, MES, Farrakka Barrage and other department. Total Number of Vacancies: Yet to notified. 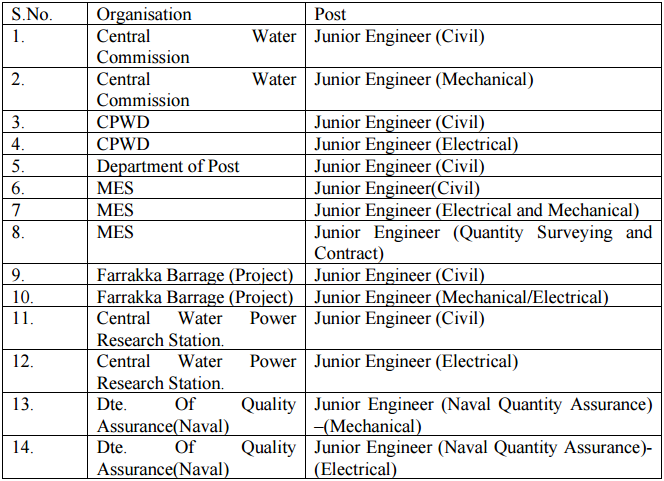 Vacancies of Junior Engineer (Civil, Mechanical, Electrical) are in Ministries/Departments of Central Government including Attached/Subordinate offices located in States and Union Territories all over the country. Reservation for SC/ST/OBC/ExS/PH/ etc. categories is available as per extant Govt. Orders. Age Limit: Candidate age should be upto 32 years for JE Posts in Central Water commission and CPWD and upto 30 years in other department. Age limit will be counted as on 01-08-2016. Age relaxation will be applicable as per govt. rules. Educational Qualification: Candidates should possess the qualification of Degree or Diploma in Civil/ Mechanical/ Electrical Engineering as per posts from a recognised University or Institution.. Application Fee: Following amount should be paid as examination fee for SSC Junior Engineer recruitment 2016. General/OBC and other unreserved category candidates need to pay Rs. 100/- as application fee. SC/ST/PWD and reserved category candidates are exempted from application fee. Application fee can be paid online if candidate apply through online mode else candidates need to pay via crossed Indian postal order. Selection Process: Suitable candidates will be selected for SSC Junior Engineer (JE) on the basis of their performance in written examination and skill test consisting of Stenography test and typing test. How to Apply: All those candidates who wish to apply for SSC JE (Engineer) posts, they need to fill online application form at ssconline.nic.in. Follow the instruction below on how to fill online application form. Log on to SSC official website at ssconline.nic.in. More Details: If you want more information about SSC Junior Engineer (Civil, Mechanical, Electrical) posts, such as syllabus, skill test, official notification/ advertisement, application form and more, read official notification followed by the link given below.